I took yesterday and today off work to look after the Macy grandgirls while their daddy goes to work and their mommy enjoys some retreat time at Sabbath by the Sea. The girls are both fun and easy, express themselves well, listen and follow instructions. To top it off, they are both very cute. 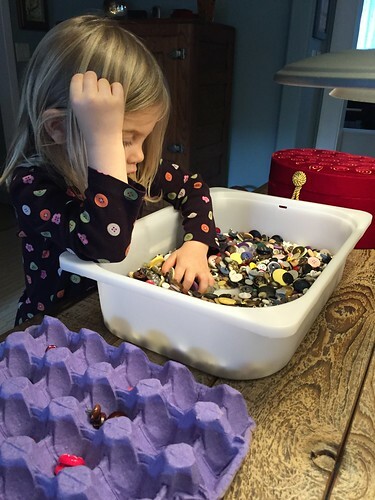 So while the house is quiet for rest time, I thought I’d share this picture of Brynn matching and sorting the contents of my button box. I poured them into a shallow container for easy swishing back and forth. Can you hear it? The sound of the search? It is most satisfying, and I think between the two of us, I enjoyed the hunt a little more than she did. After an hour and a half her attention began to wane, so we poured our “work” back into the red velvet button box and carried it to the closet. Time well spent. I might get the box out later, after she’s gone, and do it some more. Brynn didn’t know when she picked out her clothes this morning what I had in mind for her entertainment. Some things just happen.